Lake Crescent, Washington || July 9th, 2016 – Wanderer Adventurer Etc. On the humid morning of July 9th, my boyfriend Ryan and I packed up our inflatable Tower paddleboards and “hopefully enough clothes” and set off towards the Edmonds Ferry Terminal. We were headed to meet my parents, who have been camping their way around North America for the last couple of years and had finally made it to the Pacific Northwest. 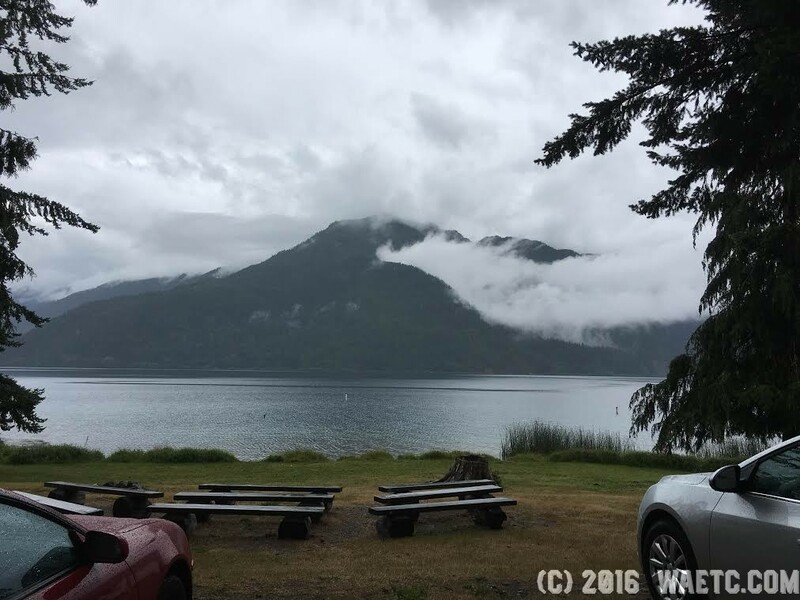 That particular weekend, they were camping at the Log Cabin Resort in Olympic National Park, a quaint collection of cabins and camping right off the shores of stunning Lake Crescent. Ryan drove while I tried to figure out this “Pokemon Go thing”, and we boarded the ferry after a quick detour and some cathartic cussing at people who tried to cut the ferry line. The ferry ride was beautiful and surprisingly quick; I had just a few moments to run to the front of the ferry, take pictures (without dropping my phone), and get my hair sufficiently messed up so I could later explain to anyone who asked about my hair that I had “been on a ferry”. Unfortunately, no one asked, but if they had, I would’ve been ready. Also, yes, there are a surprising amount of Pokemon in Puget Sound.We lost cell phone reception pretty quickly on the Olympic Peninsula so we continued on our journey Pokemon-less. It was probably best for everyone. We made a quick stop at Sequim’s (rhymes with “swim”) 7 Cedars Casino for lunch, where I put $2 in a slot machine and walked away with $16, thus solidifying 7 Cedars as my favorite casino ever. This was my first time traveling through the Olympic Peninsula and it was neat driving through the towns, each with their own specialties, personality, and tourist traps. Unfortunately, we couldn’t fall for those traps this day. We had places to be. We found the Log Cabin Resort just off of a long, windy road that lacked defined lanes and was barely sufficient for bi-directional traffic. But it WAS paved. So that was good. We found my parent’s pop-up camper quickly, but finding them proved a bit more difficult without cell phone reception. Luckily it was a small campground and we found them staring off across the waters of the Lake Crescent. “Which way to the lake?” I exclaimed as we approached. We all laughed, because it was literally right there. Since we arrived so late, we wanted to get on the water as soon as possible. We toted our rolled up boards to a grassy patch near the water and, 10-15 minutes and 3 pairs of burning triceps later, we were ready to paddle! Ryan and I boarded our boards just off shore; there was a perfect underwater rock ledge that let us put our boards in without scraping the fins and while only getting wet to our ankles. This was our second time out with the boards, the first being a quick inaugural paddle at our local lake that gave us a bit of confidence since we knew they wouldn’t sink. However, we were still cautious as we got our sea legs. Though I’ve been SUP-ing for years, inflatable boards prove a bit more sensitive to waves and weight shifts than the solid boards I learned on, so having an inflatable SUP is a bit like playing on expert mode. We stayed on our knees as we paddled over to the boat rental area where my parents were securing their favorite mode of water transportation: a nice, sturdy canoe. Once everyone had their vehicle, we set off across the lake. Even though it started drizzling, we were having a great time. I was able to stand up for awhile, but with ran and a bit of boat traffic, I mostly opted for kneeling approach or, as I like to call it, the “training wheels” approach. Now, let’s talk about Lake Crescent. Lake Crescent is amazing. First of all, it has brilliantly clear, blue waters caused by low nitrogen that inhibits the growth of algae blooms. This allows you to see down hundreds of feet in some places. It is an incredibly deep lake. In fact, they’re not sure how deep it is. Last time it was officially measured in the 1960s, it was found that the lake was 623 feet deep, but those readings were flawed as work crews found it to be nearly 1000 feet when power lines were being laid more recently. Since it is Olympic National Park, there’s a plethora of wildlife, flora, and fauna to admire. There are trout that live in the lake, as well as bright orange newts that you might catch a glimpse of chilling on the bottom or swimming to the surface for a swift gulp of air. We found a little shallow area just straight across from the resort where you couldn’t go a foot without seeing one of these fascinating little creatures. Don’t touch ’em, though. They’re hella poisonous. (And if you didn’t click the link, I did, in fact, mean poisonous, not venomous. They’re practically leaching poison, so no licking.) There are also a lot of deer that like to hang out on the narrow, windy road on the way in, so keep a camera at the ready and your foot near the brake. We started our paddle heading straight across the inlet to the aforementioned newt shallows. The water was clear and calm, save for the occasional speedboat that threatened our “on-board” status. Not long after we made it across, my parents had to head back to camp to make it back before their canoe rental was up, but Ryan and I continued exploring a bit and came across a neat little metal bridge spanning a small pool called “The Devil’s Punchbowl”. We later learned that this bridge is part of the Spruce Railroad Trail, a 4-mile trail that we’ll have to check out next time we are there. As we drifted towards the pool, we saw a brave soul scale the rocky ledge above the pool and jump straight into the deep waters. We were like “nope”, but it was fun to watch. 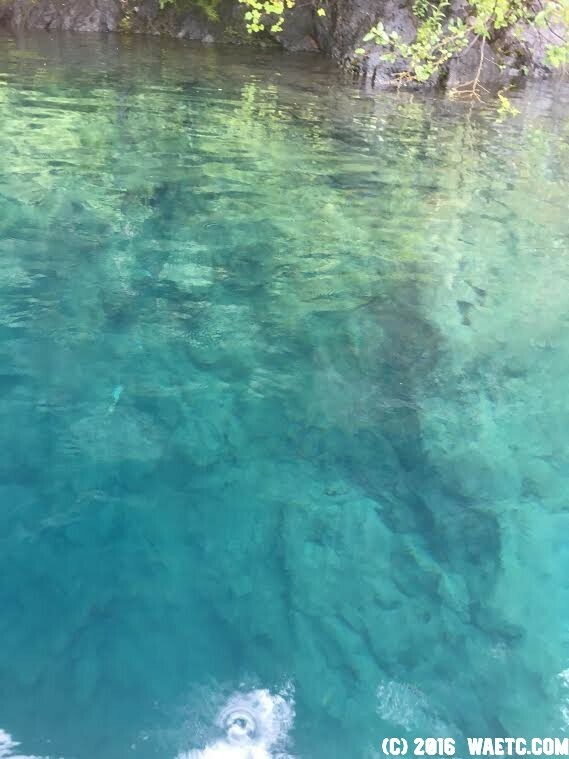 We paddled under the bridge in between cliff-diving daredevils and admired how you could see the rock of the cliff continue down into the water until it was too dark to see. Pretty surreal. That’s, like, so far down. We paddled back soon after, not really realizing how much of a workout it was until we disembarked and tried walking. After a slow trudge up the minor incline to our campsite, we grabbed our quarters and shower necessities and headed to the campground’s bathroom. It was kind of a fun experience using a coin-operated shower, but it definitely gave me a deeper appreciation for the non coin-operated variety. Though the showers were kept amazingly clean for the amount of mud present at the rainy location, it was still a bummer when I dropped some of my clean clothes on the floor and had to return to camp without them. Thank goodness for towels, am I right? The evening was spent having a nice family dinner and taking an absurd amount of time to make a fire out of wet firewood and questionable kindling. We found plenty of flammable material cleaning our cars out and soon had a roaring fire. To celebrate, we ate so many s’mores and it was great. 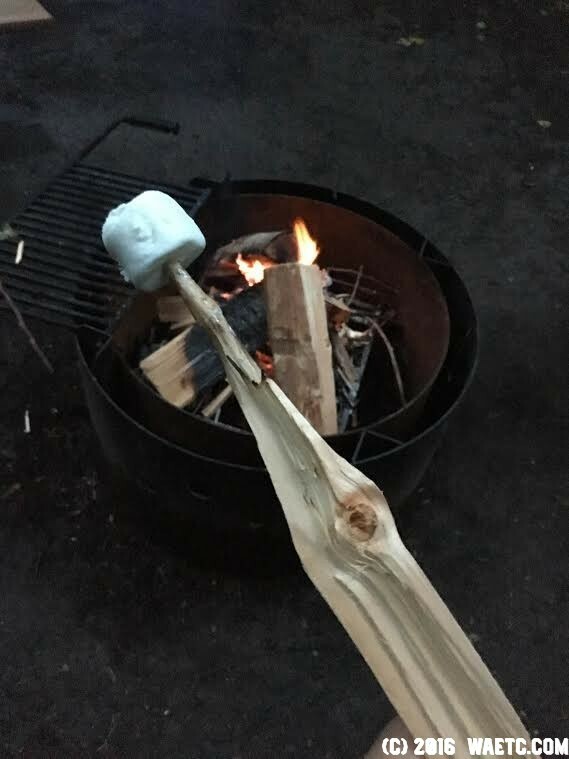 (Picture: The marshmallow stick my dad whittled out of kindling because we didn’t have any marshmallow sticks. Pretty impressive.) After a few rounds of Uno for old-times sake (I highly recommend this game while camping), we all hit the hay. Pro tip: it’s super helpful to be extremely exhausted AND having a sugar crash when you’re sleeping in the vicinity of a bunch of snorers (myself included). For the first time ever (seriously, ever), I was the first one up and at ’em in the morning. As everyone slowly rolled awake, I was able to sit outside for awhile and enjoy the quiet. I also enjoyed that our paddle boards hadn’t moved from their position on the picnic table; it was nice finding them where we left them. After a quick breakfast, we headed out on the water again, a little more lazy this time. We admired the newts and showed my parent’s “The Devil’s Punch Bowl”. I even opted to take a little swim near the “Punchbowl”. I had brought my goggles, so I wanted to check out the rocks below. It was pretty incredible, and I even saw a little trout, but it was really cold. Also, I hadn’t yet tried getting back onto my paddleboard in open water, so it was a little…. messy. I ended up having to go towards the rock wall to hop back on, and by then I had attracted some attention and some helpful people were coming to my aid. Whoops. Well, that’s why I chose to do it there, so I knew I had least had a.) a place to stand to hop back on, and b.) witnesses. And now I know I need more practice in case I fall off somewhere more remote. As all good things must, our quick adventure was unfortunately coming to an end. We slowly paddled back, packed up our things, grabbed a quick lunch at the resort restaurant (recommendation: try the garlic fries) and wandered a bit before we had to hit the road. After a short rock-skipping contest at a little rocky patch near the water, we said our goodbyes to my parents and started heading home. They were spending a few more days at Lake Crescent before the next leg of their adventure, and we had to be back home for work the next day. Le sigh. After weaving our way out on the deer-infested road (no joke, we saw like 8), we were on the highway and headed back to the east. 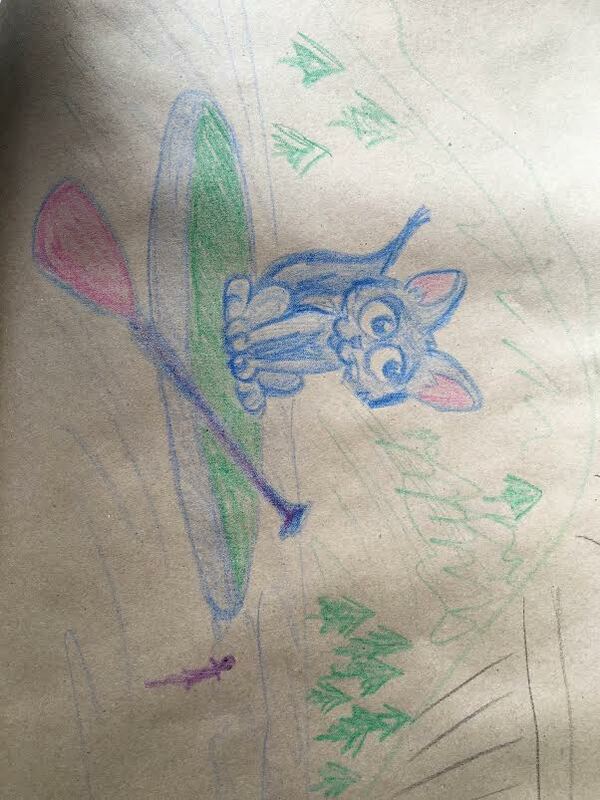 The restaurant provided crayons and a paper table cloth to draw on, so naturally I drew a paddleboarding cat with a little newt. Naturally. Since one of the categories we fall under is “coffee tourists”, we stopped at Sequim’s Hurricane Coffee and picked up an iced Americano and bag of beans on our way across the peninsula (we finished the bag of coffee last week and I’m still dreaming about it. It was so. Good). We narrowly missed a large traffic issue when the Hood Canal Bridge got stuck earlier in the day, so that was lucky. A short ferry ride and a few Pokemon later, we were home. We rinsed off our paddleboards and equipment and set them out to dry, and then we we did absolutely nothing until we had to go to work. It was such a fun weekend, not only because I got to spend time at the stunning Lake Crescent, but because I got to spend it with some of my favorite people. I don’t get to see my dad and stepmom much since they are usually gallivanting across the world, but it’s nice when our paths cross and we can spend 24 hours catching up and having adventures together. It was also fun because Ryan got to have a glimpse of what my childhood was like since camping with my dad was one of my favorite memories of growing up. 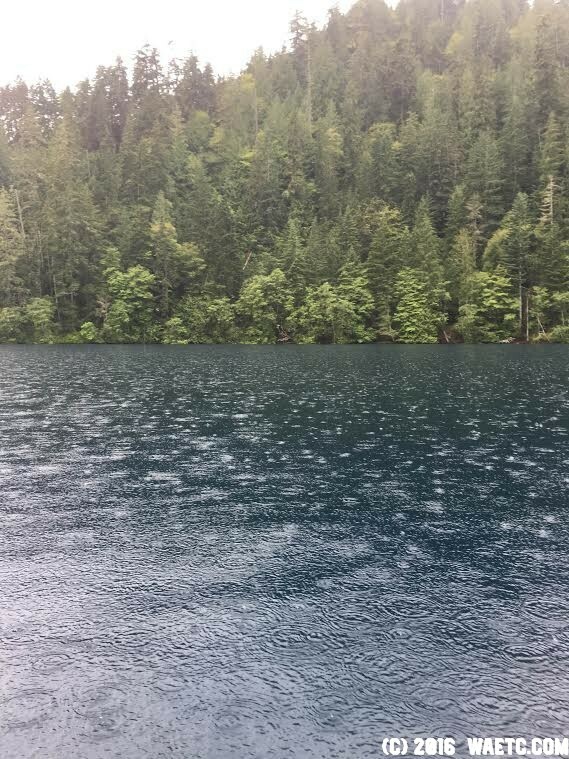 Overall, our first Lake Crescent experience and second experience with our SUPs was amazing. I can’t wait to go back. “Lake Crescent.” Wikipedia. Wikimedia Foundation, n.d. Web. 31 July 2016. Loved the article. Great memories. The pristine waters of this deep, glacially carved lake make it an ideal destination for those in search of natural beauty.